Rug hooking is easy to learn! One of America's oldest folk arts, rug hooking is the technique of taking strips of wool and pulling them through a woven base, creating a beautiful pattern. Although easy, most rug hookers are continually learning new concepts and techniques. This is Gene Shepherd's free beginning rug hooking video. It shows you step by step instructions for hooking your first rug. There are also a few pointers for more advanced rug hooking. ENJOY! This is a free clip from Hooking Rugs from Start to Finish with Deanne Fitzpatrick. What equipment do I need to get started with rug hooking? The three must-have tools are: a hook, a frame to hold your backing tight, and embroidery scissors. Some "nice-to-have" tools include a mechanical wool cutter, a sewing machine for stitching lines around your design to keep your backing from fraying, textile dyes and measuring spoons. What fabric is used for hooking? Wool. 100% wool is best. It dyes beautifully and will last - so you can pass your hooked piece down to your kids and grandchildren. There are several types of backings used for hooking. Each one has it's own qualities, some good and some not so good. The Colonial women used burlap feedsacks as the backing for their rugs. The feedsack burlap wasn't designed to last a long time. As a result, very few of those rugs are around today. Angus burlap is inexpensive and can be purchased at Wal-Mart for about $3 a yard. Scottish burlap sells for about $15-17 a yard. It's a better quality burlap with threads that are pretty uniform in spacing and size. Monk's cloth seems to be the backing of choice among hookers. It's a very soft and pliable, even-weave cotton fabric available in widths of 72" to 144". Unlike burlap, it doesn't shed at all and some of it even has a "grid" thread woven into to it. You can use monk's cloth for either primitive/wide-cut or narrow/cut wool and like Scottish burlap, it sells for $15-17 a yard. And finally, we have Scottish linen, the most expensive of the backing fabrics. It's an offwhite even-weave fabric... very strong, flexible, and easy to work with. It will also probably outlast other backings. It comes in 60" widths and sells for $25-27 a yard. How do I cut my wool into strips? There are several different methods of cutting your wool into strips for hooking... some inexpensive, some not so cheap. But there's nothing wrong with working your way up the expense ladder. An Olfa rotary cutter is the least expensive and cuts one strip of wool at a time. A "cutting machine" is a hand-operated mechanical cutter with various sized blades allowing you to cut narrow (1/8") to wide (1/4") strips - and you can cut 4 strips at a time. There are several manufacturers (Bliss, Fraser, Rigby) and several models to choose from. Can I use recycled wool? Sure! 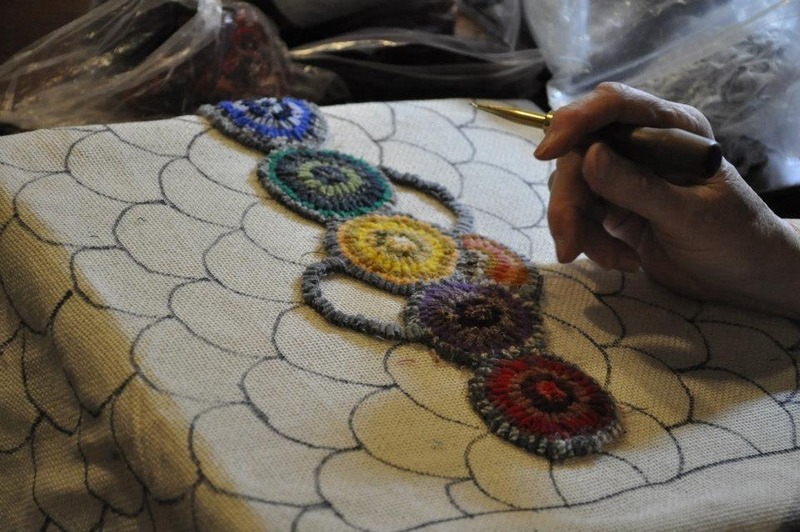 Wool obtained from deconstructed garments, blankets or other household items can be re-purposed for rug hooking. Good sources are thrift stores, garage sales or the closets of your family! Wool must be laundered to prepare for hooking. May be overdyed, used "as is" or added to stash. Other terms to describe recycled wool are "reclaimed" and "up-cycled". What does "Primitive" mean in rug hooking? A simple, whimsical style of hooking that can be rustic or aged in appearance. Color and scale are often unstructured and child-like which adds charm to finished pieces. Primitives are always done as a wide cut and motifs do not include formal shading or much detail. Packing is the common bad habit of pulling up too many loops in an area of the design. Each loop should be visible and not created too close to its neighboring loops when filling a design area. To avoid, try skipping at least 1-2 spaces on the foundation between loops and rows. Here is a mental visual aid: A row of hooked loops should resemble fat novels on a shelf, not thin magazines!